In the previous post I set out the tension between the godly meditations that St Paul urged us to – whatever is good, and pure etc. – and the raucously popular stories about pirates that outsold everything else in a bookshop around St Paul’s Cathedral. In Captain Johnson’s A General History of the Robberies and Murders of the most notorious Pyrates he describes pirates as hostis humanis generis – enemies of all mankind. However, I’d like to posit that a better description would be (and forgive my Latin translation here) umbris humanis generis – the shadow of all mankind. It is important to note that the lion’s share of the material recorded about pirates in the 17th and 18th century was written by those who had suffered at their hands – educated Westerners. Pirates themselves were mostly uneducated and little interested in recording their exploits. So when we read of them as morally corrupt, mindless thieves, we have to be a little careful. 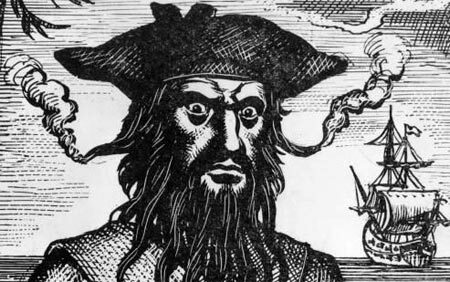 Pirates became pirates as an act of social resistance. And their ‘turning to thievery’ is actually better seen as a move into autonomy: they are simply thieving for themselves now, rather than sailing under the auspices of an Empire and pillaging on some greedy Prince’s behalf. In fact, most modern-day Somali piracy can be read in the same light. Be careful not to be taken in by the exotic sensationalism of the media – young black boys toting automatic weapons, hanging off the back of luxury vessels. As I found out when I spoke to the head of DfID (the UK government’s development agency) for Kenya and Somalia, most of these pirates are unemployed fishermen. Their seas have been made barren through over-fishing by European trawlers, and by companies dumping toxic waste off their coast, in the knowledge that a dysfunctional Somali government will do little to punish them. Piracy for poor Somalis then is more of a shore-tax: they see billions of dollars of cheap goods being sailed through their waters, while they lie in abject poverty, forgotten by the capitalist machine that passes them by. And it’s this aspect of piracy as a rupture in an already corrupt system – as a shadow that makes the Empire uncomfortable – that we’ll look into in the next post. Too true, and that’s not even considering the toxic waste being dumped, and the fish that are quite literally being stolen from them.